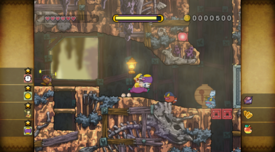 Its-all Mine is the third level in Rocking Range in the game Wario Land: Shake It! As the name states, it is an abandoned mine that, like Stonetooth Cave, has a bunch of conveyor belts. The cave also has some fossils and stalagtites protruding from the ceiling. Many Bomb Blocks are also located here. The area also has a haven of Pitchforks, which can be used to reached to treasures. The 'Golden Enemy' here also happens to be a golden Pitchfork. After Wario locates the caged Merfle through the use of Certainty Switches and conveyor belts, Wario will need to scurry back to the start before time expires. The escape sequence music is the same as from Stonetooth Cave. This page was last edited on January 16, 2019, at 10:39.